Today we are going to cover two products, motion sensors and occupancy sensors. We're doing this because both are related as they generally serve the same purposes, but they accomplish them in different ways. Just how they differ will be covered in the next section. So with out further ado, let's get moving! These devices perform a single function, detect motion, sound, or a combination of both to detect activity in an area. That space can be a room or hallway in a home, or an outdoor area near a door, gate, or window. The most common use is in home security systems. But the useful applications for these movement detectors go beyond security. These sensors can also trigger lighting to turn on or off , open doors and gates, and lock or unlock them when motion is detected. Anyway they are applied, these handy little devices provide as many benefits as they do utility. That's why they are the 6th way we're introducing to you to make a home smart. There are two types of motion sensors, passive and active. The most commonly used in homes are passive infrared sensors. These sensors detect movement in heats sources in a space, such as the heat emitted by people and animals. When a person or animal walks into the sensor's range the change in heat is detected, triggering the device. PIR sensors are good for detecting large motions, such as a person walking around a room, but they're not good at detecting smaller motions like someone sitting as a desk and typing on a keyboard. Occupancy sensors are a more advanced solution to detecting the presence of people. As a result they are also more reliable and significantly reduce to occurrence of falsely turning lights on or off. There are two types of occupancy sensors. One type emits ultrasonic (sound) pulses throughout a room and receives the bounce back. Motion causes changes in the bounce back, telling the sensor someone is present. The second type is a dual-tech sensor. These sensors use both PIR and ultrasonic to detect motion. They are the best for detecting major and minor motion in a space. Another benefit of dual-tech sensors is that they are the most reliable, providing the fewest false detections. Motion and occupancy sensors come in both wired and wireless forms. The wireless devices are easier to install, but come with the necessity to replace the batteries which power them. The batteries in most wireless sensors last one to three years and life varies based on the level of activity in an area and the energy requirements of the sensor. At one point or another in our lives we've all found ourselves walking into a dark room while our hands are full, struggling to flip the light switch with an elbow or some other ill-equipped body part for the task. 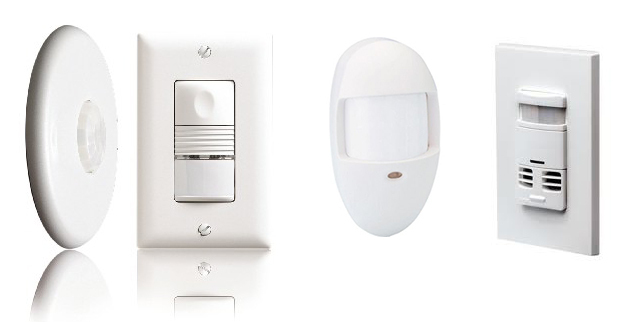 As the image above depicts, motion sensors are great at eliminating the need to reach for that light switch. No more tripping over objects on the floor you can't see. Simply walk into the room and the lights come on automatically. Setup as a zone in the alarm system, a motion sensor triggers the violation of its zone when the system is in armed state and motion is detected. They are also used to trigger outdoor lighting to deter people from snooping around areas of your property they shouldn't be. Another great application is for families with children. Despite mom and dad's best efforts kids are notorious for leaving lights on in every room of the home. In this case occupancy sensors are the solution. This type of sensor relies on motion detected by sound pulses to determine when a room is occupied and when it is empty. It's better at detecting smaller motions making it better suited for this purpose. Once all motion has ceased in a room, the lights are turned off. It's a great energy saver and it frees parents from a unending challenge. The last use case we'll discuss is using these detectors to trigger doors and gates to open or unlock. This is an application frequently used in retail stores to open the doors as a customer enters or exits a store. But, you can use them to perform similar tasks around your home. It's great for people who have mobility issues, are prone to falling, or other disabilities which have difficulty opening doors. 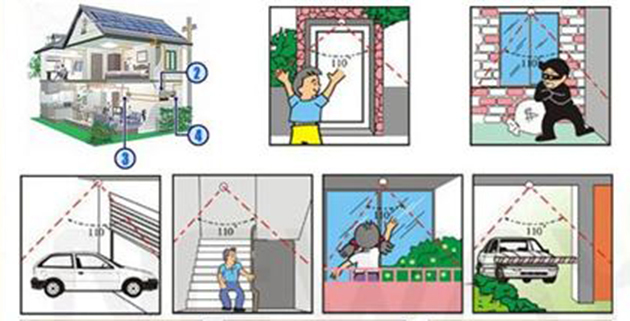 In this case safety around the home is improved by eliminating a potential hazard while increasing the accessibility for the home owner.